Standards such as NFPA 99 and CSA Z32 require isolated power systems in all areas deemed “wet procedure locations” in healthcare facilities. Isolated power systems offer an invaluable advantage - early detection of ground faults allows for critical systems to remain online in a single fault condition. BENDER isolated power panels provide isolated power to electrical systems in operating rooms and other critical care areas. Utilizing the latest in technology, BENDER equipment ensures that electrical ground faults are detected and located fast and automatically, in compliance with the latest standards and code requirements. Modular system allows for easy future system upgrading. Front trim features completely concealed hinge when closed, allowing for easy cleaning and periodic maintenance. Communications Gateway – provides integrated web service for viewing status and changing settings. Equipment designed in strict compliance with many electrical codes and standards, including NFPA 99, NFPA 70, CSA Z32, UL 1047, and ISO9001:2015 quality management system. Click here for more information on our on-site support services. In a hurry? Ask about our quick ship options to get your panels shipped in less than 72 hours! All backboxes are fabricated from minimum 14GA galvanized steel. Surface mounted enclosures are finished with a coat of hospital ivory baked enamel or equivalent. Manufactured from minimum 14GA type 304 stainless steel with #4 brushed finish, the front trim contains a fully concealed, lift-off style hinge and a breaker panel door with hidden hinges and a flush mounted key lock covering the loadcenter. A flush mounted front trim extends 1“ on all sides of the backbox. For surface-mounted panel boards, the front trim has the same dimensions as the enclosure. Isolation transformers are available with various primary and secondary single-phase volt-ages. See ordering information for available primary and secondary voltages. The BENDER LIM2010 series Line Isolation Monitor provides both digital and analog displays. The LIM is available with readouts and response values of 2 mA or 5 mA. The LIM2010 utilizes a unique measuring principle and is capable of detecting all combinations of capacitive and resistive faults, including balanced, unbalanced, and hybrid faults. A self-test and self-calibration function is included. The LIM2010 can monitor for additional alarms, including over- and under voltage, load monitoring, over-temperature, and more. The LIM2010 may be combined with an installed BENDER EDS series module to create a ground fault location system. For more information, refer to the LIM2010 technical bulletin (document number NAE2022010). 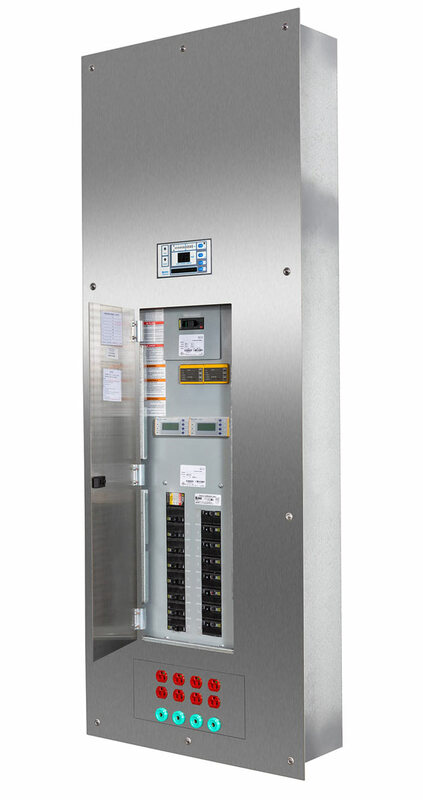 The loadcenter is an integral part of isolated power panels. Included is a primary circuit breaker which provides protection for the isolation transformer. All isolated power panels may be configured with either plug-in (snap-in) or bolt-on branch circuit breakers.